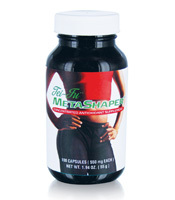 This groundbreaking supplement contains all-natural, easily absorb-able ingredients that help you achieve your fitness and weight-management goals safely and steadily. In 2011 I made a goal to run a 5K, so in October of that year my daughter Natalie and I signed up for the local “turkey trot” on Thanksgiving Day. To prepare, I walked in my neighborhood, which has very steep hills, for six days a week. My Sunrider program was eating NuPlus, Quinary, Fortune Delight, Calli and Sunectar daily. In addition to that, I decided to take MetaShaper and MetaBooster. On the day of the walk, I really wasn’t sure I’d be able to run the full 5k. When my daughter and I arrived though, I realized I really wanted to! 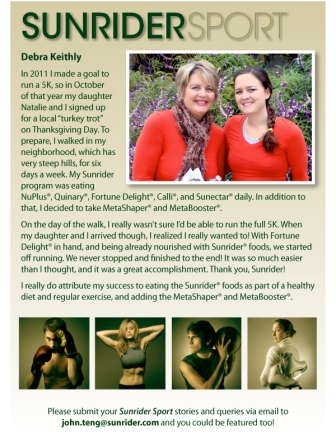 With Fortune Delight in hand, and being already nourished with Sunrider foods, we started off running. We never stopped and finished to the end! It was so much easier then I thought, and it was a great accomplishment. Thank you, Sunrider! I really do attribute my success to eating the Sunrider foods as a part of a healthy diet and regular exercise, and adding MetaShaper and MetaBooster. My First 5 K with my daughter and Sunrider! Be the first to review “Tei-Fu MetaShaper” Click here to cancel reply.